My friend Laura has just announced that she is going to be a part of the BBTB design team. I am so happy for her and I know that she will blow everyone away with her beautiful designs. I had never heard of "Bitten By The Bug", so I had to check it out. What a wonderful idea for all of us who use a Cricut machine. LOVE IT!! A challenge was announced this past Sunday (check it out) on their blog to use the AND SIGN (AMPERSAND) from either the PLANTIN SCHOOLBOOK or the GEORGE CARTRIDGE . I need a Wedding Anniversary card for my boss, so I of course chose to take part in this challenge and hit two birds with one stone. 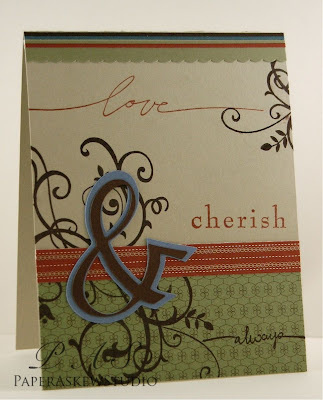 I used the George Cartridge to make the "amersand" and the rest is from Stampin' UP! The DP and borders were from a Stampin' UP! kit which retired a couple of years ago and I finally just pulled it out. Nothing like hording. On another note, I am so excited to have had so many comments left on Sunday's post. You guys rock and sure know how to make me feel good. I am so glad that Al was able to fix the problem. I loved reading what kind of sweets you all enjoy. If I can find the recipe for Black Bottom Cupcakes I will post it tomorrow for you all to try. Thanks for the little toot!!! :) Your too sweet! I love your card it's beautiful! Thanks for playing along. Beautiful again Pam! I was looking at doing this challenge as well, only if I could find the time right now.